Candidates after viewing the JIPMER Assistant Professor Recruitment 2018, will get understand with Experience and Education & Age Criteria. 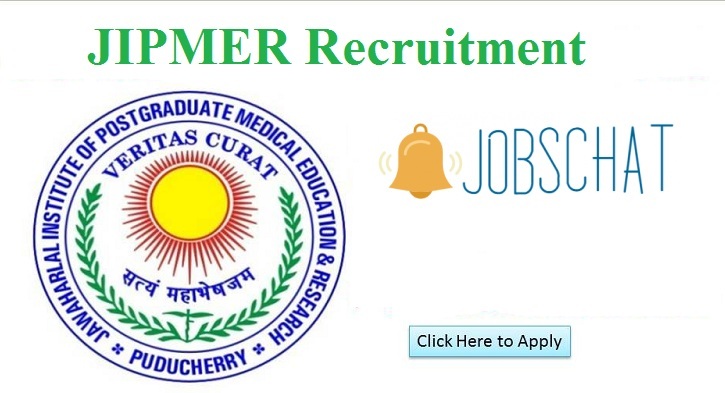 Then the candidates may evaluate their candidature for this JIPMER Puducherry Recruitment 2018 and then Sends their application with complete details before the ending date i.e 31.08.2018. One of The Famous Organisation, JIPMER Offered the JIPMER Faculty Recruitment 2018 Dated on 30th July 2018. It offers a total of 67 Posts which is combined with the Professor & Assistant Professor Jobs. That too the JIPMER officials mentioned that this JIPMER Recruitment Notification 2018 for Faculty Jobs only For Experienced Persons. Candidates belong to India who wants to get Teaching Jobs may open this JIPMER Faculty Notification 2018 as its one of the Golden chance to settle in India Jobs. Applicants need to aware that securing the Job in JIPMER is not that easy. So, it is advisable to Fastly complete the Registration for the JIPMER 67 Faculty Job Vacancy 2018 till 31.08.2018 by sending the Application through email. No Other modes of Application will be accepted. Coming to the Latest JIPMER Announcement Jobs, JIPMER Faculty Recruitment 2018 is the Trending one where it is offering the employment opportunity for Various Experienced Persons. As the Notification is put forward on 30.07.2018, from the same date onwards the Registration to this JIPMER Professor Recruitment 2018 is started and JIPMER accepts as many applications as possible in order to find the Most talented and Experienced Persons in the available Subjects. And the officials after Interview decides the person either for Professor or Asst Professor Jobs as per www.jipmer.puducherry.gov.in Recruitment 2018 of Faculty. Applicants who grossed their Qualification in Medical Field/ PG degree/ PhD in the Respective Field in which the Aspirants going to register and must possess atleast 12 Years in the Respective Stream in any respective field. Candidates as of 31st August 2018, must acquire the following age limits in order to Enrol for the JIPMER Faculty Recruitment 2018. Age Relaxation: 03 Years for OBC and 05 Years for SC/ ST contenders. ” The Director, JIPMER, Puducherry”, which is payable at SBI Bank, JIPMER Branch, Puducherry – 605006. JIPMER, Puducherry will choose the Aspirants based on the Interview round only. The Qualified Persons for the JIPMER Professor & Assistant Professor will get the Following salary per month. We the team of www.Jobschat.in have placed every tiny point of JIPMER Recruitment For Faculty like Official Notification, JIPMER Faculty Application Form, Annexure and Credentials. So, the Contestants who opened this page need not open another page also to get better information other than ours about this JIPMER Professor Job Vacancy 2018. And coming to the JIPMER 67 Faculty Jobs, Category wise Vacancies are available where it is also mentioned here. Contenders after checking it clearly can Submit their JIPMER Professor Application Form through Email till 31.08.2018, and after this date, no more applications will be considered for the JIPMER Recruitment 2018 process. We also offer the Interview Syllabus for the Applicants here. JIPMER Board after the Final date of registration will verify the application forms who submitted for JIPMER Recruitment 2018 of 67 Faculty Jobs and Validates them if the application is eligible to the eligibility criteria mentioned. Then after fixing the Interview dates, the information will be sent to candidates registered email as per JIPMER Professor Notification 2018 and for Interview TA (second class Railway Fare) will be paid to SC/ST candidates only and the Remaining persons will attend on own and JIPMER Will offer the Job only for Best Performers of Interview and Experience Level and pays the Remuneration as per JIPMER Norms.